The History of Joyce Green is rather extensive so we have broken this down to two distinct periods. These run from 1914 – 1948 and then from 1948 – 2000 under the new NHS. Empty, fevers, 1000+ refugees from East Europe, empty, fevers, empty, smallpox, empty, EMS Hospital (Emergency War Hospital) and then NHS General Hospital summarises the state of the hospital from 1919 to 1939. The refugees from Europe were suspected of being smallpox contacts and were admitted on 7th & 8th July 1918. Examinations and re-vaccinations were carried out and two cases of smallpox found. The period of quarantine expired on 25th July and their dispersal to unspecified places commenced. Other infectious diseases found were chiefly among the children: rubella 20, chicken pox 18, scarlet fever 4, and other diseases 47. One patient died from influenza. In order to help with the preparing of the hospital, they obtained the services of a company of German prisoners-of-war from the Dartford War Hospital (the Lower Southern Hospital in peacetime). When the refugees left they presented Dr Cameron with a silver epergne to show their gratitude. He wrote in his weekly report to the MAB ‘ It was unfortunate that I was quite unaware of their intentions. Otherwise I should have taken steps to divert their intentions into a more suitable channel in the form of something in which the staff generally might have shared’. The immediate post-World War I years were dominated by the worldwide flu epidemic and fevers notably scarlet and diphtheria. Mortality from these was heavy but less seems to have been made of the epidemic than had it not followed four years of war carnage. 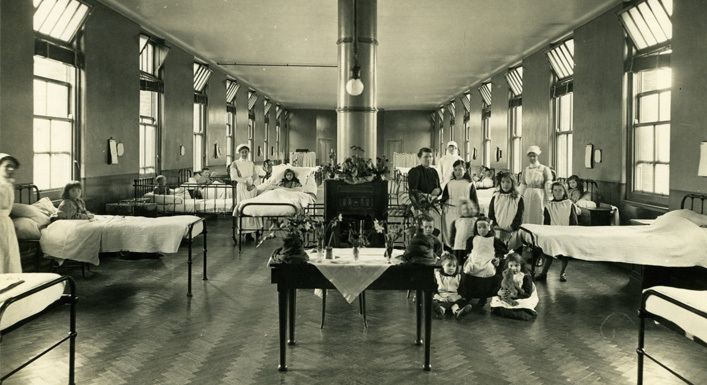 Inevitably morbidity amongst the nurses was high, for instance in 1921 the Medical Superintendent Dr A F Cameron, reported that the 30 nurses and ward maids had scarlet fever and 3 diphtheria. An unacceptability risky job by today’s standards, but this was the price paid for nursing some 900 cases of scarlet fever and 150 cases of diphtheria. The death of seven patients in one month seems quite small when compared with the 25% death rate of severe smallpox, but in the mild form (Variola Minor) seen in the epidemic a decade later the death rate was only 1%. In truth there was not much that could be done for fevers apart from isolation and nursing. How much these measures helped to halt the epidemics is not clear, for the patients, mostly children, would have been infectious at home with coughs and sneezes well before they reached the hospital. Once there, isolation was probably longer than necessary, but it was clearly wiser to err on the side of caution. To clothe this convalescent army the hospital stock in 1927 included 2,805 pinafores, 2,767 chemises and 5,004 flannel vests, of which 182 were missing… and being put to good use in SE London no doubt! Ranges of antiseptics were available but no specific remedies were being used when in 1924, it was established that bacteria (streptococci) were the causal agents in scarlet fever. The hunt was on for ways of killing them but the ‘magic’ penicillin was still many years away. Routine bacterial tests were not available in those days so it was not possible to know if streptococci covered the skin or not. Whatever the reason, effective antiseptics, good nursing, loss of virulence by the streptococci or a mix of all three, the epidemic died down and by 1923 the hospital was empty again. The next time Joyce Green was filled with disease it was the disease for which it had been built – smallpox. It was the milder type (variola minor) and the mortality was less than 1%. It enabled Dr Cameron’s assistant Dr J P Marsden to report on the epidemic in which he analysed the 13,500 cased seen between 1928 and 1931. This established his status as one of the top smallpox experts in the country; the River Hospitals being the main treatment centre for the disease in England. After 1931 Joyce Green was never again used for smallpox, Long Reach being reserved for this purpose and Joyce Green lay empty until rudely awakened by the trumpets of war in 1939. No one could have guessed from reading the Medical Superintendents (MS) reports that 1930 heralded in a new era, for in that year the London County Council (LCC) took over from the MAB. The most obvious change was the prompt closure of the River Ambulance Service. It had been struggling for a long time, under used, with inadequate cost-cutting maintenance and difficulty in attracting suitable staff. Then, as Long Reach was being rebuilt, smallpox broke out. The managers found a suitable Captain and the service resumed. By this time patients were being sent to Joyce Green at the rate of 500 per month, no doubt a good test to the ‘land ambulances’ that were soon to become the standard method of transport. Collision with the steamers and wharves, was an increasingly frequent reason for the boats to come out of commission and the protruding paddles were particularly vulnerable, as can be gauged from a study of the Engineer Surveyor’s Report Book. ‘ The final blow came on 24th July 1930 when a steamer collided with the Lower Dolphin at South Wharf and with Albert Victor. That settled it, henceforth all patients, still coming at over 200 a month went by road. In the last 6 months of their working life the steamers had transported over 2,500 patients to Long Reach – an impressive finale. However, it was not for 3 years that the LCC finally finished it all. The Engineer Surveyor’s last report is dated 10 March 1933. ‘The steamer Geneva Cross left South Wharf on the 21st February, the Maltese Cross on the 28th February and the Red Cross on the 6th March for mooring at Erith, preparatory to disposal, after being disinfected and certified as such by the Port Sanitary Authority. The first two proceeded under their own steam.’ It suggests that up till the end they may have been used to ferry patients, staff and stores between North Wharf Blackwall and South Wharf Rotherhithe, for lack of a better way of crossing the River. The end of the River Ambulance story came in 1940 when South Wharf, still used as a smallpox collecting point, was destroyed by German firebombs. Joyce Green, in 1939, was made into an EMS (Emergency Medical Service) hospital and for the first time became a general hospital. It retained the services of the Medical Superintendent, Dr Mitman and other medical staff included a Military Registrar and his R.A.M.C. detachment. The hospital accommodation was increased from 986 to 1,900. B Block was converted for use by sick staff, and a decontamination hut for the treatment of gassed cases was prepared in the old mortuary of the Orchard hospital. Staff accommodation was also increased and the committee rooms, sitting rooms and all other available space was changed into dormitories for the staff and resident R.A.M.C. detachment. On 1st June 1940, Joyce Green received over 160 Dunkirk service casualties, including 24 French and 4 Zouaves. The 130 British came from over fifty units, the biggest number coming from the 1st Suffolk’s with five. Among the oddities was a farrier from the 6th Cavalry Regt. with varicose veins. Dispersal began on 8th June when the Naval patients went to their own hospitals and a lightly wounded batch of twenty-nine, four of them French went to the Three Counties Hospital Ordsley, Bedfordshire. A second and bigger wave of French, making fifty-two in all came on the 8th June. Among them were ten from the Jaquar, a destroyer sunk off Dunkirk on 23rd May by torpedo boat. Records suggest that they were transported from Dover in Green Line ambulances. The French came from some 20 units including crews of vessels. At least 12 were from the Dunkirk garrison. The three for Liverpool went to Broad Green Orthopaedic Hospital along with three others. Eaton Hall was an officer training centre on the Duke of Westminster’s estate. On the 22nd June 1940 the Ministry of Health issued a directive that Joyce Green among other hospitals ‘must be ready to receive patients from coastal and certain inland hospitals in Kent which are being evacuated as a precautionary step in the face of threatened enemy action. Nurses will accompany the patients and residential accommodation will be required. Date, time, numbers and travel will be forwarded later’. On the 5th September 1940, Intelligence warned of an invasion threat for the 15th. They planned for the total number of evacuated patients but not nurses as had been previously considered. What was Joyce Green’s contribution to these evacuations? On the 5th August, 24 servicemen arrived from the County Hospital Chatham, it being in the evacuation zone which extended up the Thames estuary to Rochester; but bombings may have been an added factor. Three days later 44 came from the Kent and East Sussex, some with gunshot wounds and some with medical conditions. The invasion scare of 5th brought no patients from the Kent coast evacuation for it was the height of the Blitz and Joyce Green’s eyes were directed towards convoys of ambulances from London. In fact it was from the County Hospital (now West Hill) that the convoy eventually came, with 113 patients, after it had received a direct hit. On the 31st December 1940, the Medical Superintendent Dr Mitman reported that there were 924 civilians, 169 military, the latter mostly skin cases in a ‘special dermatological unit’ serving the whole of the South Eastern Region and sector X of the London area. This was in ward block 8. From 1st January 1944 to 30th September 1944, the Netherlands Military Hospital was based at Joyce Green (but the last patient did not leave until the end of 1945). During the nine months the unit was at Joyce Green it treated 10,054 patients. As payment the Ministry of Health submitted to the Netherlands Ministry of War a bill for £4,310. This was calculated on the basis of 9 shillings (45p) per patient per day. When the unit closed Dr Mitman accepted responsibility for the Netherlands patients still in the hospital and one assumes this is why the Dutch Authorities awarded him the Oranje Nassau medal. The patients’ library at Joyce Green was a benefit of the war. It was stocked and staffed by the British Red Cross Society. By 1945 there were nearly 3,000 books, which, until the ready for discard, were not available for TB and skin patients. The Red Cross Voluntary Service was replaced by a paid librarian after the war and has continued to expand into the service provided today. In 1945, Dr Mitman summarised that up to May 1941 there had been 26 bombing incidents involving 64 HE bombs, 3 oil bombs, and about 200 incendiary bombs, the latter doing much damage to the wooden hutted Long Reach and Orchard Hospitals. The only fatality was on the 27th September 1940 when a member of the bomb disposal squad, Robert Ingram Ford, Sapper 2090532 of the Royal Engineers, died when a bomb exploded in an excavation in the rockery, behind the surgeon’s house, he was 21 years old. Not a single ward or other building escaped entirely and many were repeatedly damaged. At the end of 1945 almost all blackout and gas-curtains had been removed but the blast walls were still present. Staff and patients celebrated VE and VJ days. Patients were allowed to take tea with their relatives – an unheard of privilege! The special fare included for patients tinned cakes (from New Zealand), ice cream, minerals, beer and cigarettes. For children there were two new toys and sweets (also a gift from New Zealand). Staff did not qualify for the tinned caked or the beer although they did get the free cigarettes. To mark the end of the war visiting days were increased from just Wednesdays to Wednesday and Sunday from 2.30 – 3.30 p.m.
Dr Mitman’s reign as Medical Superintendent ended in 1948 with the inception of the NHS but he continued his career as Physician with a special interest in fevers. The new NHS brought changes in the running of the River Hospitals. For the first time they were general hospitals for the people of Dartford and with a locally run Management Committee. The Dartford Hospital Management Committee took over the running of the hospitals from the London County Council. The Chairman was Mr William Parry. He had been an ideal choice for the post as he was a local man with extensive experience in hospital administration, having been Assistant Clerk to the Metropolitan Asylums Board and then Principle Clerk of the Special Hospital’s Division of the London County Council. Of the River Hospitals: The Orchard had been damaged by bombs in the war and was now due for demolition and Long Reach was still being held in reserve for smallpox. As with other hospital groups Dartford trained student nurses. In 1948 the Dartford Group had three separate training schools. The school at West Hill had been established in 1921, the schools at Joyce Green and the Southern started in 1945. The three training schools were amalgamated in 1951 with a preliminary training school at the Southern. At that time the nurses from each hospital wore different uniforms so a Group uniform was adopted for all grades: – Deputy Matron – grey; Departmental Sisters – bottle green; Ward Sisters – royal blue; Junior Sisters and Staff Midwives – pale blue; Student Nurses – yellow; Assistant Nurses – apple green; Male Nurses – white. The Management Committee also authorised the issue of a badge, with an emblem of the Dartford Warbler to all nurses who passed their final examinations after the 5th July 1948. The Dartford Warbler was also incorporated into new the Group Badge which had been designed by Dr Henderson, the Medical Superintendent at the Southern hospital. In October 1953, Joyce Green became one of the six centres for the treatment of poliomyelitis in the South Eastern Hospital Region. A medical team was established and specialist training given to nurses. The iron lung used in the treatment of polio had been designed by Dr Henderson the Medical Superintendent at the Southern hospital. In 1959, it was decided to close the Southern. It was too big and deemed not suitable for modernisation, as was Joyce Green. Wards 9a and 9b were modernised, divided into sections, and painted in restful pastel colours. These were the prototype wards. The other wards had the central stoves removed, new kitchen and sterilising equipment and were redecorated. The patients and staff were duly transferred from the Southern, apart from the Medical Superintendent Dr Henderson. He retired, disappointed that the Southern had been closed. It was to commemorate the amalgamation of the two hospitals that the swimming pool at Joyce Green was built. The League of Friends started off the swimming pool fund with £500, £4,000 came from the King Edward’s Hospital Fund. The staff raised the remainder, they had collection boxes, jumble sales and market days and other events. The pool opened on 27th May 1961. Mr Kekwich, Chairman of the Hospital Management Committee introduced Mr S C Harris OBE JP, who officially declared the pool open. The opening ceremony was followed by an amateur swimming contest. In 1962 the National Plan for Hospitals was implemented. For Joyce Green this meant the installation of a lift to the wards and a covered corridor outside blocks 1-4. On 20th April 1963 Sir Arthur Porritt, President of the Royal College of Surgeons opened the new Twin Operating Suite. Mr Watts the Consultant Surgeon invited Sir Arthur to perform an operation by cutting the adhesion obstructing the entrance to the theatre. He informed him that the necessary cutting instrument would be supplied, which he trusted would be sharper that those usually supplied to him during an operation! Afterwards all the guests returned to the nurses’ sitting room for cocktails and refreshments. In 1964 the library moved from block 15 to its final resting-place in the old sewing room. The library was started during the Second World War by the Red Cross and Order of St Johns Jerusalem and was run by volunteers. After the War the books were available to civilian patients as well and still run on a voluntary basis until the inception of the NHS in 1948. After this the library was funded by the Hospital Management Committee for the benefit of the patients and staffed for the first time. In 1965 the Medical Reference Library was started to replace the books housed in the Doctors Quarters. In 1966 a Nursing Reference Library was started and these collections formed the basis for the comprehensive Medical Library we have today. The Study Centre was also opened in 1965 and together with the library was funded from the Local Government Endowment Fund. The study centre was on the ground floor of the PTS home (later Home 6 where Staff Development was), near the Pathology Laboratory. It consisted of a lecture room, meeting room and dining hall. Dr Farrant was the mainstay behind the setting up of the centre, which is why the Education Centre at the Darent Valley Hospital is called the Philip Farrant Centre. In 1965 Student Nurses swapped their corn-coloured dresses for new uniforms in candy stripes with no cuff or collar. January 1966 and Joyce Green was the first hospital in the KCC area to open a cervical cytology unit and the first hospital in the country to open a “well woman” clinic. In 1967 the new group pharmacy opened. The old pharmacy quarters became the new accommodation for the porters until the closure of Joyce Green. In 1968 it was reported in the staff newsletter the Auricle, that Mac (the gardener) and his gnomes had a green house to play in opposite the mortuary. New tennis courts were also laid. The tennis courts were where the car park was at the end of block 19 (Orchard House). March 1969 and the new psychiatry unit is opened. Blocks 18 and 19 were joined at a cost of £77,000. Patients from Constance and Christopher wards, West Hill, were transferred there. There were 54 beds at the unit, 40 for women and 14 for men, a therapy room and dining room. The unit was designed for short-term problems and patients stayed 4-6 weeks. No alcohol or drug related problems were dealt with. These blocks later became Orchard House. 1970 saw concerns over the footpath running down the side of the Cemetery. It was feared that there was a risk of catching smallpox from walking so close to the graves. The cemetery contains 1029 bodies buried in 292 graves. Many of these graves (in epidemic years) contain up to 10 bodies. They were buried in sacks stuffed with straw to absorb the bodily fluids. The cemetery was cut off from the hospital by the University Way and is now surrounded by new houses. One of the only gravestones left to be seen is to Clara Couchman, a nurse who contracted smallpox whilst nursing others. The cemetery is now extremely overgrown and this makes it impossible for relatives to visit the graves. A plan of the graves and cemetery register are held at the Library, Darent Valley Hospital. October 1970, work is scheduled to start of the new £60,000 Paediatric block 7. Changes to the wards mean that blocks 7-11 are to be medical wards and blocks 1-5 are to be surgical, blocks 18-22 are to be geriatric and psychiatric. The new Mentally Handicapped Unit (later to be Orchard House) was also opened. May 1971 and the Government produces a White Paper creating new Health Authorities to replace the Hospital Management Committees (HMC) set up in 1948. The question is will the Dartford HMC merge with the Darenth and Stone HMC which ran Stone House and Darenth Park? July 1971, a £50,000 Post-Graduate Centre is going to be built at Joyce Green, this means that Dartford will be a focal point for medical further education and training. The centre will keep doctors and health professionals abreast of the latest medical knowledge. The centre was built around block 12 and included tutorial rooms, lecture hall, dining room and kitchen, later a library was to be added. 8th November 1971, Princess Anne flew into Joyce Green by helicopter. She was met by the Lord Lieutenant of Kent, Lord Cornwallis then driven to West Hill to open the new A&E department. 1971 also saw decimalisation. The Green News (staff newsletter) runs a series of helpful hints on how to work out the new money. It also showed you how to fill out your cheques, work out your change etc. 1st April 1972 and the Dartford and Darenth Management Committee is formed with Rt Honorable Sidney Irving as Chairman. Mr Leslie Kekwick, Chairman of the Dartford Hospital Management Committee retired having served as Chairman since 1955. The Dartford Group merged with the Darenth and Stone and for the first time all the hospitals in the area are run by one body. The new Postgraduate Centre was opened on 23rd June, 1972 by Lord Rosenheim, President of the Royal College of Physicians 1966-1972. The Clinical Tutor in charge of the education of the doctors was Dr Phillip Farrant. April 1973 and B block is being converted to take the patients from Denton Hospital, Gravesend (next to the river Thames, it took seaman who had fallen ill aboard ship and who were removed by the Port of London Health Authority during their routine inspections). Denton was closed in October 1974. October 1973 and the laundrette opens. A far cry from the days when the nurses washed their ‘smalls’ in a sink in the recreation hall! January 1974, and due to the fuel crisis savings needed to be made in the amounts of heating oil and electricity used. The heating oil savings are satisfactory but not so the electricity. To help improve this, the offices were banned from using electric lighting on Thursdays, Fridays and Saturdays. Candles could be obtained from the main stores. Due to the lack of light in the dark evenings and candles not being a good idea, the library had to close at 4 p.m.
April 1974 saw more NHS reforms and the Hospital Management Committee becomes Dartford and Gravesham Health Authority. Soft toilet rolls are introduced to staff and patients in July 1974. Complaints are made by the Group Domestic Manager that the number of toilet rolls issued had increased 10 fold and accuses staff of pilfering them. They are warned to stop or face going back to hard paper again. The staff were furious and point out that the level of usage of the hard rolls was kept artificially low due to the discomfort caused, many patients and staff preferring to use tissues! Joyce Green Hospital Radio started in 1976. This wonderful service for patients is still running today, its volunteers now providing music for patients at the Darent Valley Hospital. The 1980’s see hints of a new general hospital. Sites are looked at again and again. Darenth seems the popular choice but no-one is sure. By 1985 the site is still under discussion and the opening of a new hospital is projected to be 15 years away. If only they knew! A support scheme for newly discharged elderly patients is set up in 1984. It is only the 3rd of its kind in the country. It is aimed at helping the elderly during the first 72 hours after discharge, a danger period for this age group. St James Hospital (Gravesend) is closed in 1985 and the patients are transferred to Joyce Green to the newly refurbished J Block which is renamed St James House. February 1986, the bed bureau is created in a pilot scheme. It is hoped to eliminate the time consuming search for beds by the GPs. The pilot scheme must have been successful as the bed bureau is still in operation today. February 1987, and amid the AIDS scare the Dartford and Gravesham Health Authority employ their first full time AIDS health advisor. Harry Smith’s greatest ambition when interviewed for the local paper was to be made redundant, he is still employed. Huge advances have been made in the care and treatment of AIDS but as yet there is still no cure. September 1989, £250,000 is spent on improvements to wards 13A, 11A, 11B, 5A, the twin operating theatre and endoscopy suite. At the end of October £100,000 was spent enlarging rooms in the doctors accommodation block and upgrading junior doctors rooms. A mother started the Scanner Appeal in April 1990 after the death of her son. The Jamie Styles Memorial Fund topped £20,000 after two months. It needed to raise the £600,000 for the scanner and £100,000 a year to run it for the first three years. By September 1991 Mrs Styles had raised £16,000. Health Chiefs took over the appeal and needed to raise the remaining £1.2 million. The target was reached in September 1994 and the official opening took place in April 1995. The laundry was burnt down in August 1991 causing over two million pounds worth of damage. The fire spread to the nearby boiler room and 38 elderly pateints were evacuated from their ward as fire threatened to engulf them. The hospital lost half of there linen supplies. The blaze was caused by arsonists. In October 1991 ward 13A is upgraded. It was changed to a 16-bed ward with six beds in isolation rooms for infectious diseases to replace the beds in G1. The new ward was called the Mary Gantry ward after the West Hill midwife, who, after a bomb landed on ward A1 during WW2, crawled amongst the rubble administering Morphine to trapped patients. St James House (opened to take the patients from St James Hospital, Gravesend) closed in February 1992. It was deemed unsuitable for the elderly patient’s and they were transferred to Wombwell Hall, Gravesend. July 1992 and the Day Care Unit opens. The unit consists of 11 trolleys, a surgical suite, and an endoscopy suite. The patients are treated under general or local anaesthetic and go home the same day. The Dartford & Gravesham Health Authority become the Dartford & Gravesham NHS Trust in April 1994. This is the sixth time the administration has changed at Joyce Green. The Ear, Nose and Throat Services are moved to Medway in August 1995, due to West Kent Health Authority changes. Clinics are still held locally but all patients have to travel to Medway for their operations. December 1995 and the Dartford and Gravesham NHS Trust was the first Trust in the country to provide its staff with a workshop developed by Action for Dysphasic Adults (ADA) called ‘Communicate’. The course helps staff to deal with people with communication difficulties caused by strokes, Alzheimer’s, and other illnesses. July 1996 and the casualty unit is moved to Joyce Green into a new purpose-built building despite the new hospital being only a few years away from opening. This is due to demands from the Royal College of Anaesthetists (backed by other Royal Colleges), they are unhappy about seriously ill patients being moved from the A&E at West Hill to wards at Joyce Green. With the new hospital fast approaching completion the staff and management of the hospital formed committees. Representatives from wards and departments attended regular ‘briefings’ so news could filter to all staff and question and queries that staff had could be answered. The new wards need names and a competition was launched by the Trust for the staff to win one weeks annual leave. The Trust Board considered the shortlist (Local Towns and Villages, Botanical, Hospital History, Wild Flowers) and had a clear favourite – trees. It was decided that the tree names would come from the grounds of Joyce Green (so how come we have Tambootie, Rosewood, and Ebony!). Next a name was needed. At the time of the death of Princess Diana the public response was to name the new hospital after her. This had proved to be very difficult. Royal protocols prevented a Royal name being agreed to until quite near to the opening. This was not acceptable, the hospital needed to start familiarising the public with the opening of the hospital with leaflets and posters, and road signs. So the staff and public were asked for suggestions. The Trust received over 100 suggestions and a small committee was formed to shortlist these to 8-10 names. It was decided that the staff should choose the final name and an official polling day was set. Official ballot boxes were put around the hospital and the staff received a ballot paper each. The name Darenth Valley was the most popular choice and duly announced. Unfortunately a few members of public felt the name was incorrect and the name was changed to Darent Valley despite being in Darenth Wood Road! This was a blow to all the staff at the hospitals who had voted. The name was the one big thing that all the staff had been able to contribute to. A moving plan was formulated. The 60-day moving period was flexible and ready to start as soon as the hospital was completed. It was to enable the smooth passage of all the wards and departments gradually. Plans laid, boxes ready and the packing begins. Historical mementoes were recorded and where possible, removed for safe storage. These included the War Memorial, plaques, medals, photographs, and pictures. The hospital had 97 years of history to preserve. The moving started at the end of July 2000. Pickfords carried it out with a team of 35 removal staff and 6 lorries. They moved 25,000 crates and seven and a half kilometres of medical and other records. The Darent Valley hospital opened on 11th September, 2000.